The A-A-B-B-E aircraft manufacturers, namely, Airbus-ATR-Boeing-Bombardier-Embraer, have all announce their 2013 orders and deliveries. Boeing announced its tally on 6th, Airbus on 13th, Embraer on 15th, Bombardier on 20th, and ATR on 23rd January, 2014. (today). The results get sorted as: Medium-Long Haul Jetliners: Airbus v/s Boeing, Regional Jet: Embraer v/s Bombardier, and Turboprops: Bombardier v/s ATR. Boeing made more airplanes and sold and retained more airplane orders (based on NET orders) than Airbus. The single aisle family is the best performing airplanes for both manufacturers. The Quad Jet programs aren’t doing well. Lufthansa is the only operator of the 747-8 intercontinental: the passenger version of the 747-8. Embraer seems to be steaming ahead of Bombardier’s regional jet programs. 5 orders of the E170 were cancelled, while 100 E175E2, 25 E190E2, and 25 E195E2 orders were placed. 3 CS100 orders were cancelled, while 37 CS300 orders were booked. Embraer has emerged as the world’s largest manufacturer of commercial jets up to 130 seats. 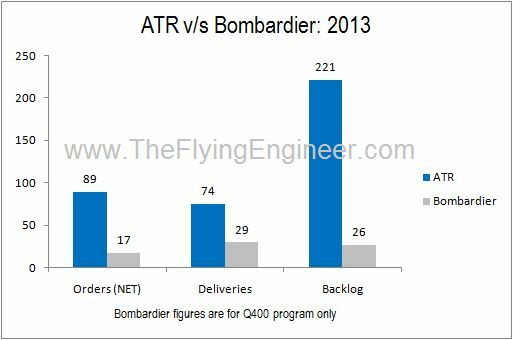 The Bombardier Q400 Turboprop program is nowhere close to the performance of the ATR 72/42 program. The above figures include 10 ATR42-600 sales and 7 ATR42-600 deliveries. Though not officially acknowledged by the airline, SpiceJet has reportedly placed an order for 42 Boeing 737 MAX Aircraft. Considering the airline’s fleet to be comprised mostly of Boeing 737-800s, the order may very well be entirely made of Boeing 737 MAX 8 airplanes. The Boeing 737 MAX 8 is expected to enter service in the third quarter of 2017, almost 4 years from now. With already 1,763 orders for the 737 MAX airplanes, it may be easily close to 2-3 years after the 737 MAX 8 enters service that SpiceJet receives its first 737 MAX, assuming that Boeing will up the production rate of the 737 jets to 47 a month, or higher to 60, from the present 42. SpiceJet is now one of 298 yet “Unidentified” Customers who have ordered 737 MAX airplanes. The airline is yet to receive 18 Boeing 737-800 airplanes from the US airplane manufacturer. 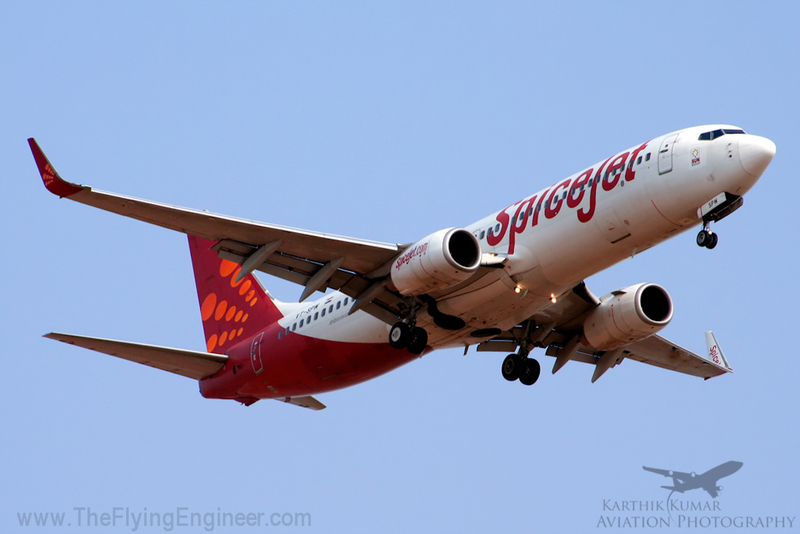 In 2013, SpiceJet received 10 Boeing 737NG airplanes, its highest ever in a calendar year. This order that speaks of an airline poised for growth 5 years down the road, is a precursor to “something” big in the airline. Note the 737NG delivery trend for SpcieJet, below, and you’ll notice that 2013 was a very happening year, for an airline about to make a big announcement in 2014: the news of the much awaited investor. Quarters are Calendar Quarters, not Financial Quarters. Just when the 747-8’s production rate was ramped down at its Everett facility (state of Washington), Boeing announced that the 737’s production rate will be ramped up at its Renton, Washington facility , from its existing 38 airplanes per month, to 42 per month in the first half of 2014, and next 47 airplanes per month in 2017, the highest rate ever for its best-selling airliner. Boeing currently has more than 3,400 unfilled orders across the 737 family, which includes the 737Max. Airbus, in contrast, has 4,223 unfilled orders across the Airbus A320 family, which includes the A320NEO. Across its global production facilities, Airbus already produces 42 airplanes a month since 2012, the highest-ever rate for any commercial aircraft, and has no immediate plans for a production ramp up over concerns of supply chain fragility. The A320 Family is produced on two Airbus assembly lines in Europe: Toulouse, France and Hamburg, Germany; which have been complemented by an additional facility in China. Toulouse is home to the initial assembly line, building A320s; Hamburg has responsibility for the A318, A319 and A321; while Tianjin assembles A319s and A320s. Tianjin is Airbus’ first assembly facility located outside of Europe, resulting from a joint venture involving Airbus with a Chinese consortium comprising the Tianjin Free Trade Zone (TJFTZ) and China Aviation Industry Corporation (AVIC). Joining this network will be a new A320 Family production facility in Mobile, Alabama USA, which is to build A319, A320 and A321 jetliners beginning in 2015. 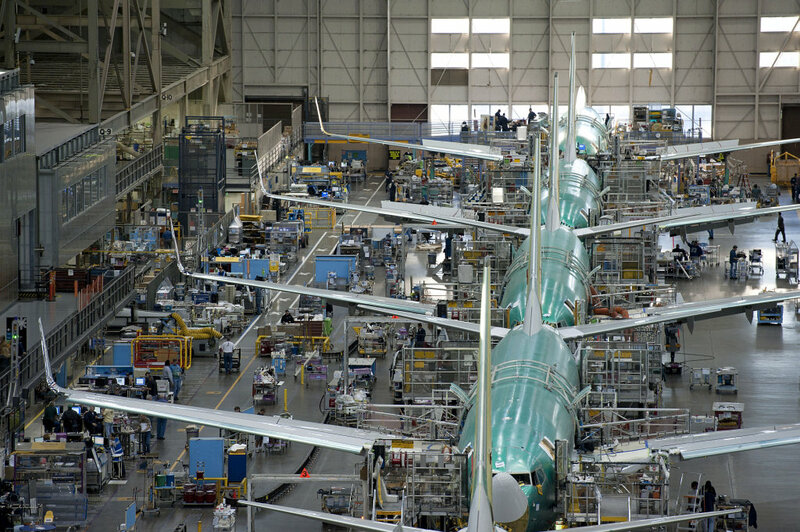 Boeing, however, produces the Boeing 737 only at its Renton facility. 737NG #4000 waiting to be assembled! Photo by Boeing, of Boeing. Its really hard to believe that a tube of metal, sitting on a transport dolly, can ever fly. The rivets are clearly seen, the skin in protective paint, and covers for where the windshields should be. This time however, the common sight of a 737 fuelage rolling into Boeing’s Renton plant, is not just another body. The only thing separating it from the rest is its number. It is 737 NG # 4000, a milestone for the 737NG program. With 2,674 737NG orders still unfulfilled, looks like the #4000 bird is going to eventually lose the limelight to # 5000, #6000, and maybe, #7000. Four celebrations to look forward to. Well done, Boeing, for a cumulative 6613 civil Boeing 737NG variant orders as of Feb end, 2012, of which 59.5% have been delivered. 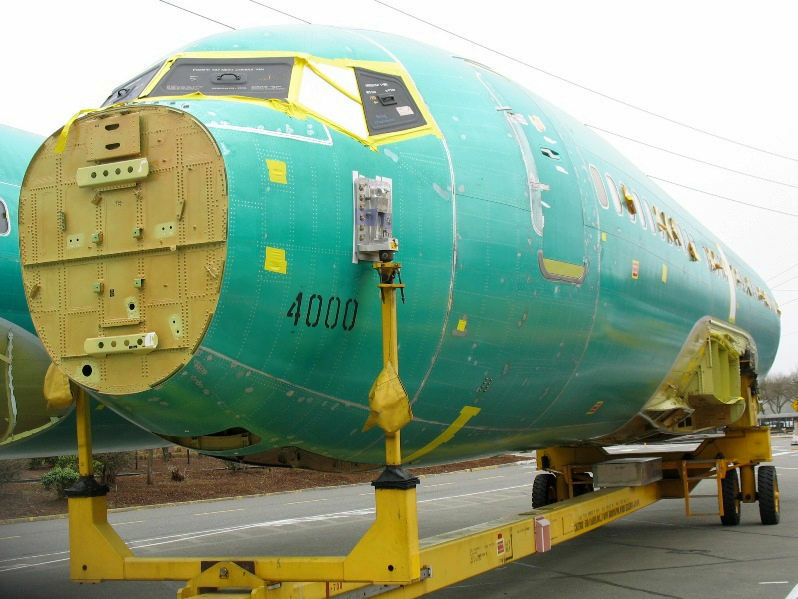 With the October 2011 announcement by Boeing of the 737NG production rate having been ramped up to 35 airplanes a month (“Rate 35”), 737NG #4000 should be completely assembled by the 3rd week of April, 2012. #5000 should be ready in the September of 2014; #6000 in the January of 2017, and #7000 in the June of 2019. Which is why Boeing CA CEO Jim Albaugh, in July 2011, asked his product development team to evaluate the feasibility of further ramping up production to 60 airplanes a month. As of today, the 737NG production will hit “Rate 42” by mid 2014, witnessing “Rate 38” from “Rate 35” somewhere between then and today. Assuming Rate 38 hits in January 2013, And Rate 42 in mid 2014, #5000 should be out in July 2014; #6000 in July 2016; and #7000 in July 2018, advancing the earlier projected 7000th airframe’s delivery by one solid year. Boeing badly needs Rate 60, keeping in mind that the Boeing 737 MAX is expected to enter service in 2017. Disclaimer: Author estimated/assumed production rates. An estimate is an estimate, and an assumption always an assumption. Just for you to get a feel of when you’ll expect the 737NG that you order, today.